SOUTH STREET SEAPORT — The Seaport Museum New York is in financial trouble, sources told DNAinfo this week. The 44-year-old museum, which teaches visitors about the history of New York Harbor, laid off at least five workers last week, including the captain of the Pioneer and a marine educator who had been working there for 10 years, sources said. The museum's tax returns show the museum had an operating deficit of over $1 million in 2008, but turned a small operating profit in 2009. The numbers for 2010 are not yet available. But several sources familiar with the museum's situation, who spoke on condition of anonymity, said the institution's financial position is dire. While board members have lent the museum millions of dollars so it can continue to operate, the museum does not have enough money to order basic supplies or maintain its fleet of historic vessels, which is deteriorating, the sources said. "The place is really tapped out," one of the sources said. "It's a barely functioning organization." Nelson Chin, a volunteer deckhand for the museum, said it has been impossible to get the tools and materials he needs to maintain the boats, some of which are more than 100 years old. "The volunteers end up donating…the things that should be there," said Chin, 43, a Brooklyn resident. "It's very disheartening. I spend my free time to help preserve and operate the boats, and then you see the organization that owns the boats not putting in the attention that is necessary." Rusting metal, peeling paint and worn rigging are just some of the problems with the ships, Chin and other sources said. To make money, the museum has tried to sell some of its historic vessels, including the Peking, Lettie G. Howard, Helen McAllister and Marion M., sources said. However, the boats are in such bad condition that it is hard to find a buyer, one source said. 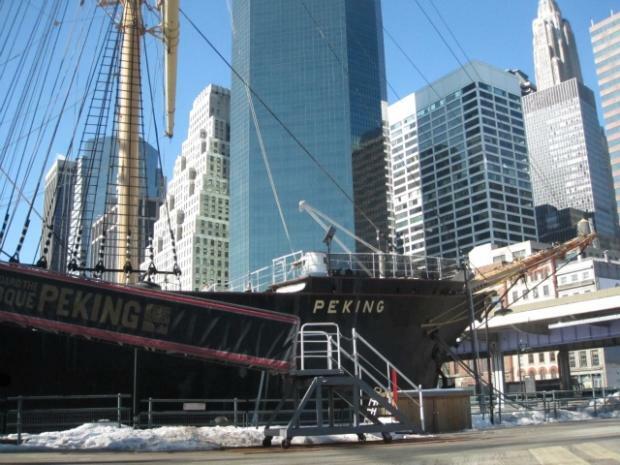 The source said a potential buyer of the Peking backed out because the boat needed millions of dollars of work before it could ever sail again. "Like many cultural institutions, Seaport Museum New York is dealing with a variety of challenges resulting from the economic downturn. The museum's executives and board of trustees are working diligently to address and meet these challenges in the interest of ensuring the museum's fiscal health and its ability to carry out its cultural and educational missions." Several sources familiar with the museum said they believed the problems stem from the leadership at the top of the organization. One source said President Mary Ellen Pelzer and Chairman Frank Sciame are not doing enough to improve the museum's position. They have laid off people who used to promote the museum and raise money, which just makes the situation worse, the source said. As an example, the source said the Pioneer, a potential moneymaker that runs chartered voyages for about $2,000, sat idle at Pier 16 most of the summer, because it had no customers. The 1885 schooner made just 14 chartered voyages in 2010, down from 50 in 2007 and more than 100 in 1992, the source said. "No one knows we're there," the source said. "We're the best-kept secret in New York. I think that is a big mistake." Neither Pelzer nor Sciame responded directly to requests for comment. This is not the first time that the museum has run into trouble. The institution struggled to rebound from 9/11, as tourism dropped downtown. In 2004, the museum cut its staff, laying off its maritime historian and closing its library. When Pelzer, formerly the museum's general counsel, took the helm in 2007, the museum was on the verge of closing, she said in 2008. Pelzer and Sciame launched new exhibits geared toward a younger audience and hired consultants to create a strategic plan. One result was that the institution recently changed its name from the South Street Seaport Museum to Seaport Museum New York. But the museum's woes continued, and in 2008 and 2009 board members loaned the institution about $4 million combined so it could continue operating, according to tax documents. Sciame alone contributed more than $1 million. Word of the museum's troubles has recently spread among the city's maritime history community. "It's a shame," said Betsy Haggerty, president of the North River Historic Ship Society. "It's a wonderful institution. I hope they find a way to get it back on its feet."